Cut the peel off one grapefruit, removing all the white, bitter pith. Peel segments over a bowl and remove the skin, letting the segments fall into the bowl. Cut the segments in half crosswise. If you have accumulated 3 Tablespoons of grapefruit juice from the peeling process, put it into a shaker jar. If you haven’t, cut the remaining grapefruit in half and use 3 Tablespoons of the juice, reserving the other half for another use. Add the olive oil, shallot, lime juice, salt, fennel seeds and pepper in the jar with the grapefruit juice and shake vigorously to combine. Taste and adjust vinaigrette and seasonings as desired. Save ½ cup of the dressing for the salad and pour the remaining vinaigrette into a medium glass bowl. Add shrimp and toss to coat with dressing. Let shrimp set for 30 minutes at room temperature, tossing occasionally. Prepare grill to medium high. Grill shrimp until just cooked through, about 1 ½ minutes per side. Transfer to a plate and let the shrimp cool slightly. 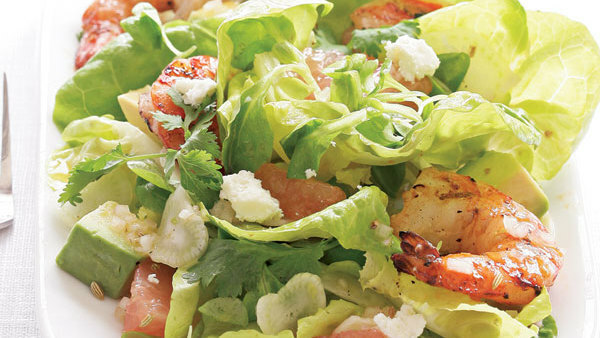 Place the chilled lettuce, mache sprigs, sliced fennel and cilantro in a large salad bowl. Pour the dressing over the salad and toss gently to just coat the salad. Plate the salad on individual plates. Scatter the cubed avocado, grapefruit and shrimp evenly over the salads, arranging decoratively. Drizzle with remaining dressing and sprinkle with a little of the goat cheese.